Click Here To See Fear #31 Comic Book! 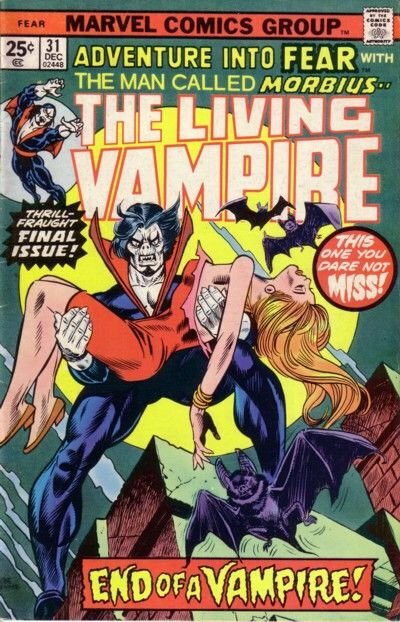 Check out this very nice 1975 MORBIUS cover prelim, which was penciled and inked by the great Gil Kane, from the story titled: "The End of a Vampire!" This nice cover prelim to the VERY LAST "FEAR" issue measures 10.75 by 13.25 inches (with no logo area above it) and is drawn on art paper, featuring Morbius standing on top of a building, while holding a passed out girl, with 2 bats flying behind him! A GREAT Cover prelim to own without paying a published cover price, while still showing off Gil Kane's pure untouched pencils AND INKS, just before he tightens the cover up for publication! SWEET! Compare this nice cover art to the published comic book in the red link above!